For Sale: One Transit System. Slightly Used. A Faded Beauty and a Handyman’s Special. No reasonable offer refused. Call Honest Rob’s Transit Hotline for details! Adam Radwanski’s article in this morning’s Globe and Mail triggered a flood of emails between the latté-sipping chattering classes today as journalists, politicians and transit advocates tried to make sense of Mayor Ford’s scheme to upload the TTC, or at least its subway lines, to Queen’s Park. By the end of the day, the McGuinty government had replied “no thanks” to the offer, but the issue will still get lots of debate. I have to wonder if the Mayor has really thought through what he has proposed. Here are a few small questions. The City’s share of the operating and capital deficits for the entire TTC, including Wheel Trans, is over $1-billion. How much of this would the province actually take over? If Toronto wants better service — things like trains every 5 minutes at 1 am on a line carrying almost nobody — would Queen’s Park send us a bill for service in excess of their own standards? If Queen’s Park got only the subway system, how would revenue for the TTC as a whole be shared? Would the subway become a separate fare zone with its own GO-like premium fares? Would the revenue split be skewed to make the subway “profitable” even though it depends for its huge demand on the surface feeder network? If Toronto wanted a subway on Sheppard, but Queen’s Park thought that an LRT line was all the street really needed, (a) how would the City force Queen’s Park to build it and (b) would Toronto have to pay the difference in construction and operating costs for a subway? Why should provincial planning trump local preferences when this almost never happens in any other sphere of provincial influence worth mentioning? How much will it cost Queen’s Park to buy out objections from Hamilton, Mississauga, Ottawa and every other transit operator about an unfair subsidy by way of a Toronto upload? Anyone who has dealt with GO Transit on a construction project, or with Metrolinx on transit financing, will know that “transparency” is not their watchword, information is difficult to come by, and future planning consists of whatever is announced in the provincial budget. Don’t look for a politician because the board is a collection of untouchable agents of the private sector bringing their expertise to bear, don’t ya know, but certainly not interacting with the public on a day-to-day basis. Radwanski reports that Queen’s Park wants ownership of lines it pays for to stay on its books. At first, this looks like little more than accounting dodge — a way to show an asset to balance of the debt floated to build, say, a new subway. However, a book asset’s real value is that it can be sold. Remember Highway 407? What would prevent Metrolinx from selling the Sheppard line to a private owner with no control over what the new proprietor might charge us for the use of “their” subway? Would fares go through the roof just like highway tolls? Selling or uploading the TTC is a hare-brained idea that does nothing to address the basic transit problems both Toronto and the GTA face. Transit is a big, expensive business, and somebody has to pay for it. Cook the books all you like, there is only one rider, one taxpayer, one citizenry stuck with the bills at the end of the day. Debating who might “own” the transit system diverts attention from vital transit advocacy. Mayor Ford and Premier McGuinty should concentrate on transit plans and strategies that are achievable, and convince voters of the need for good transit funding, even if this means new sources of revenue. The table showing the route cuts linked in this article contained an error, and this has been corrected. 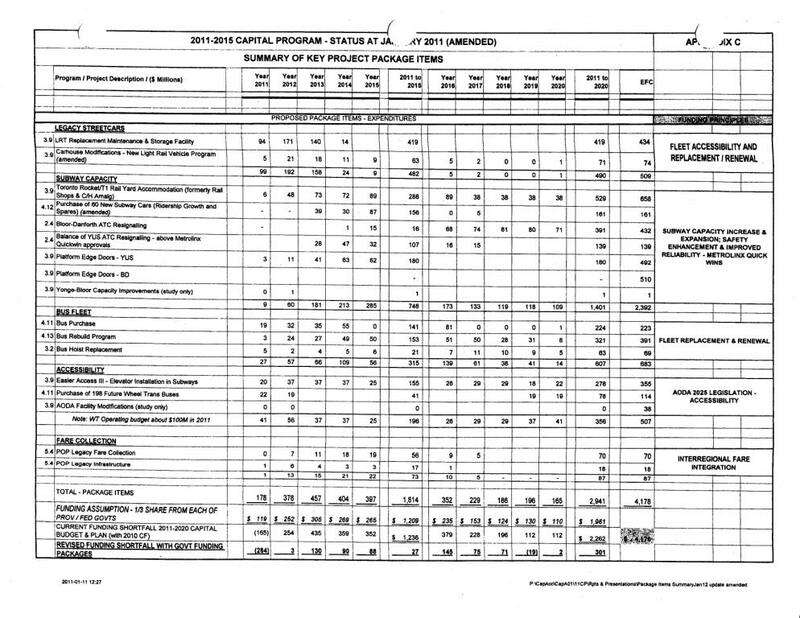 In the original table, I calculated the imputed cost/hour and cost/passenger of the services under review by dividing the annual vehicle hours saved and passengers affected into $7-million. However, that saving would only have taken place over 9 months, and its annual value would have been about $9.33m. Therefore, the imputed values, corrected for full-year savings, are $70.74 per vehicle hour and $7.16 per rider. Some reports have claimed that the current subsidies are $30/rider, and this is not borne out by the TTC’s own numbers. The actual values will vary from route to route and day to day, but the average is about 1/4 of this claimed value. Indeed few of the services up for cancellation reach the $30/rider subsidy level as is evident on the updated and expanded spreadsheet. The link to the table is reproduced here for convenience. In other news, I have now learned that the service improvements implemented in January 2011 are to be funded out of the savings from the late night cuts. These improvements have an annual cost of about $4m, leaving only $3m for fall 2011. However, about $1m will be lost to the delayed implementation of the cuts, leaving only about $2m for service additions in late 2011. It is worth noting that some routes appear on both maps indicating that they have a proposed service cut in one period to pay for an improvement in another, although we don’t know exactly what that may be yet. TTC management unveiled its Capital Budget and 10-year forecast on January 12 with a presentation to the Commission, and followed up with a presentation at the City’s Budget Committee on January 14. Online information about the budget is incomplete. More troubling, however, the “Blue Books” which contain the details of all capital projects have not yet even been issued to members of the Commission, let alone Councillors or, it would appear, the City’s Budget Analyst who is supposed to digest all of this on Council’s behalf. Full consideration of the TTC budgets was held over to January 20 by the Budget Committee to await the Analyst’s Notes. Meanwhile, the TTC presented a budget with previously unknown major capital projects and additions to existing ones, but with little explanation of why they are here. Oddly enough, the City’s Executive Committee only yesterday was in turmoil over unexpected increases in the cost of hosting the Pan Am Games due to unplanned costs for soil remediation and the fact that the project estimate was in 2008 dollars. The TTC would do well to understand that surprises in budgeting will not be warmly greeted by the City, and moreover that they can have a compounding effect of squeezing available funding for other projects. In this article, I will give an overview of major points in the budget along with specific comments on a few major issues. When the “Blue Books” become available (expected later this week) and I get a chance to review the full budget, I will write on major topics such as subway fleet planning and system expansion in detail. 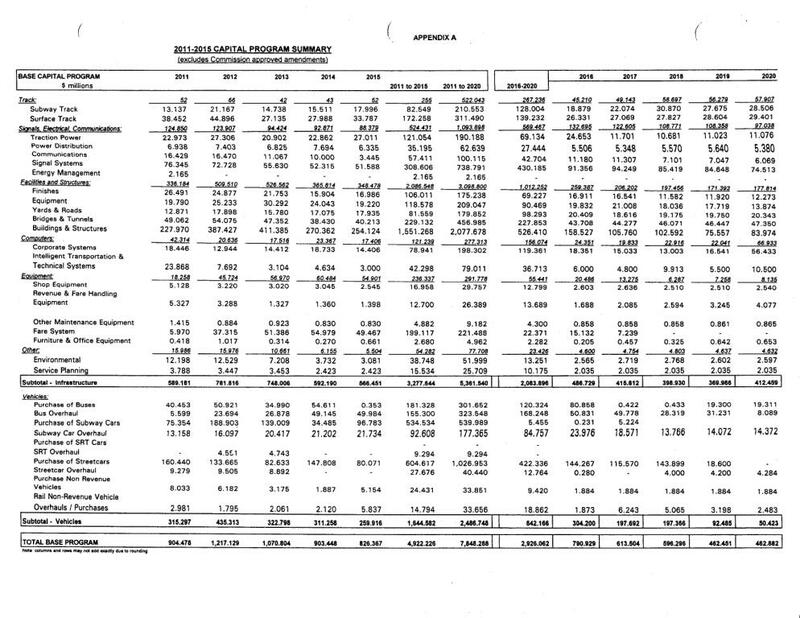 This article provides additional details on the TTC’s 2011 Operating Budget including information in a presentation given at the January 12 meeting, but not available online. A table listing cost recoveries for Canadian transit systems has been added at the end of this article. 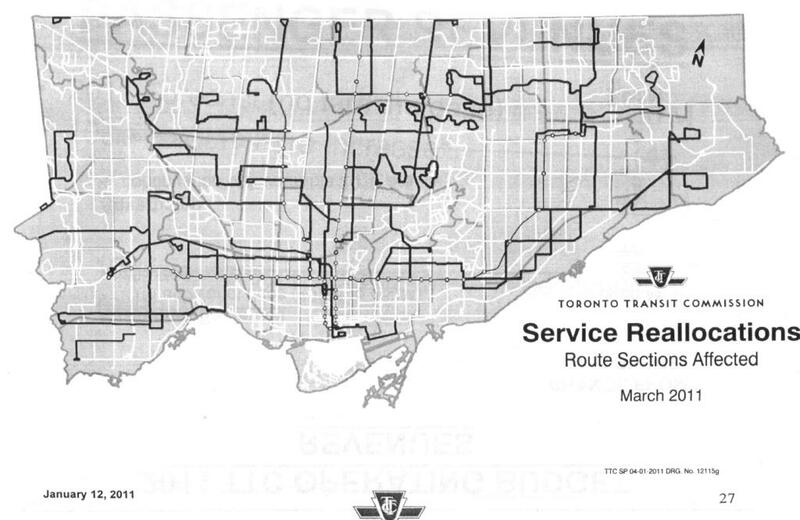 On January 14, the TTC made its presentation to the City’s Budget Committee. The linked document covers all three budgets: operating, Wheel Trans and capital. 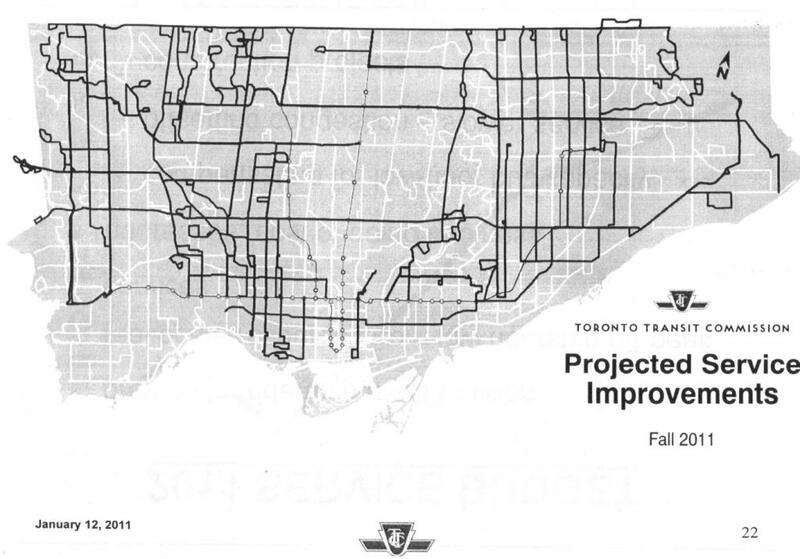 Much supporting detail that was included in the TTC’s own budget presentation on January 12 is not in this document. The detailed presentation is still not available online. I will comment on the Capital Budget in a separate article. Information has been added to the “Cuts & Additions” section regarding the annual savings from proposed cuts and their value expressed on a per vehicle hour and per passenger basis. The TTC’s revenue/cost ratio continues to run well above that of other cities and for 2011 will be about 70%. Farebox revenue for 2011 is budgeted to rise by about $53.5-million relative to the 2010 budget which underestimated ridership. Actual farebox revenue for 2010 is expected to be $40m above budget and, therefore, almost 80% of the jump for 2011 is attributable to strong ridership in 2010. Advertising revenue for 2011 is expected to rise from $15m in 2010 to $20m in 2011 as a direct result of the improving economy and stronger demand for ad space on transit vehicles. This is an example of a revenue stream where the ebb and flow of income has a non-trivial effect on fare and subsidy debates, although it is rarely mentioned. With a projected farebox revenue of $941.5m and expenses of $1,429.1m, the farebox will account for 65.88% of total expenses. Other non-subsidy revenues will bring in $58.7m or 4.11% of the total. The remaining 30.01% will come from city-funded operating subsidy. Updated January 12, 2011 at 5:30 pm: Today the TTC decided to defer the matter of the proposed service cuts to its meeting on February 2. I will comment in more detail on both the Operating and Capital budget presentations that were made today (they are not available online). Vehicle reductions: This is the TTC’s estimate of how many vehicles will be saved, and these numbers won’t always be the same as in the table I produced because of assumptions about interlining. Customers affected: These are the people who now use the service. Equivalent to “boardings” used in a calculation below. Customers lost: This is the TTC’s estimate of the riders who will be lost. Generally this is much less than the number affected because the TTC assumes people will walk to another route rather than abandoning the system. Boardings/service hour: For some reason, this appears only for a subset of the cases shown, although you can calculate the values. If the proposed cut is 2 vehicles for 3 hours, then this is 6 service hours. Divide that into the number of people affected to get the boardings/hour. The screenline for cuts is 15 (not 12 as previously reported) boardings/service hour. The TTC has already noticed one “oops” — the Downsview Park bus on early Saturday evenings carries 267 riders in the three hours between 7 and 10 pm, or almost 90/hour. Saturday daytime, it carries 176 in the 13 hours from 6 am to 7 pm, or 13.5/hour. However, it is likely that a good deal of this riding is concentrated later in the day, and it will be easy to get over the screenline by taking this into account. I will digest this chart with additional calculations in a post tomorrow. The methodology has a certain prejudice depending on the type of route. For example, very short routes tend to have a lot of turnover and rack up boardings quickly. Long routes handle longer trips, and the resources used per boarding are proportionately greater. This means that a long route has to have a higher average load to meet the boardings/hour criterion and escape cuts. For routes that don’t do well, this is something of a moot point because they are never going to the cut, but this sort of systemic error in analysis becomes important if, in 2012, the bar is raised to cut more “unproductive” services. CITY-TV reports that according to TTC Chair Karen Stintz, the City’s budget allocation for operating subsidy to the TTC will remain at the same level in 2011 as in 2010. This would be an increase over actual spending in 2010 because the TTC ran a “surplus”, at least on paper. From the Chief General Manager’s Report up to the end of October 2010 we know that the projected subsidy requirement was running about $60-million below the originally budgetted level. Of the expected $430m subsidy, only about $370m would actually be needed. Some of this “surplus” arises from better than expected riding and fare revenue, and partly from some operating cost savings that may not be repeatable (an unexpected dip in fuel cost, for example). If the TTC had been required to take a 5% cut relative to budget levels, this would have meant a $21.5m cutback in subsidy, but since they actually only used $370m, they would still be ahead of the game. Getting the whole $430m is a bonus. However, the total TTC budget is about $1.37-billion, and a 5% increase would not be unexpected given the combined effect of wage, service and materials increases. That would eat up roughly $64-million. Stintz confirmed that there will be some service cuts in 2011. One important budget pressure is the “Customer Service” file which will trigger new spending in many areas. This is a challenge for the TTC and a delicate balancing act — if service gets worse, it will be hard to deliver that service with a smile. The bigger challenge for the TTC and for Council is the multi-year view of budgets. There won’t be a big “surplus” (actually underspending relative to budget) in coming years, and real dollars will have to be found either on the revenue or expense side of the ledger. Council is supposed to be moving to multi-year budgeting, but there is not yet anything definitive on this nor on the effect for medium range transit policies. As I write this, a special TTC meeting to deal with budget matters is rumoured for next week, but it has not yet been publicly announced. The City Budget Launch meeting on Monday, January 10 may provide more details. The original article from December 23, 2010, follows below.